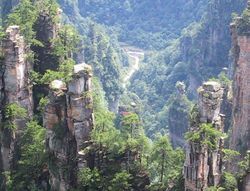 How to Plan a Tour of Zhangjiajie gives some suggestions about planning a tour in Zhangjiajie, including a list of recommended attractions, meals, hotels and popular tours. Tianmen Mountain takes its name after the Tianmen Cave, a natural karst cave under the mountain. The mountain is relatively gentle, full of old trees, winding vines, mosses, stalagmites, sits upon 494 acres. Zhangjiajie Tourism: TripAdvisor has 12,259 reviews of Zhangjiajie Hotels, Attractions, and Restaurants making it your best Zhangjiajie resource.